The pictures for listing are a sample as this is a made to order item. No two bouquets are exactly alike. A mixture of blooms of hydrangeas, lavender, celosia, roses, peony flowers/buds, Various dried florals, botanicals and herbs. Wonderful natural decor for your living room, studio, or bedroom for a nice year 'round decoration. This extra large dried floral bouquet measures approximately 20 inches tall by 12-14 inches wide. Stems wrapped in jute and has jute loop in back for hanging. This bouquet is quite lovely all in all. The hydrangeas in the bouquet are especially beautiful, truly the highlight of this item. The colors are rich, but not quite as vibrant as the photo portrays. The dried pieces on the backside of the bouquet appear more weathered and crinkled than I would’ve liked, but still attractive. Overall, I am pleased with the purchase and it is displayed on my dining room table. It has received many compliments. 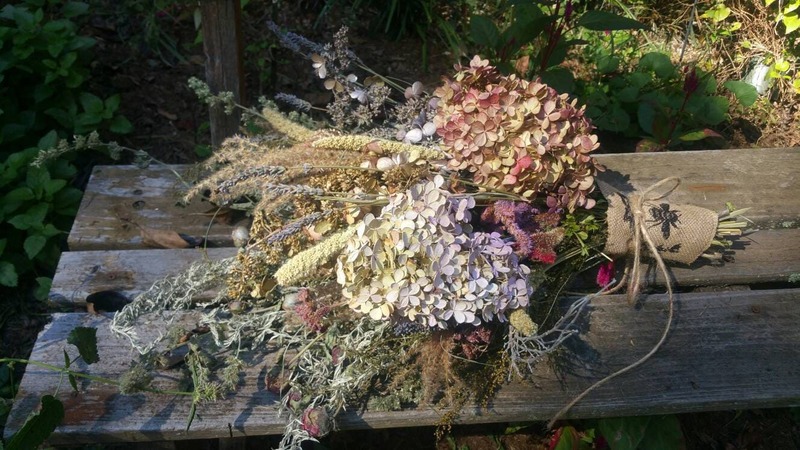 Beautiful dried floral arrangement. I used it in my grandmothers antique crock and put it in my bay window. Absolutely gorgeous! Super fast shipping (very well packaged) and great communication from the seller. I highly recommend purchasing from this store and I will purchase again. Thank you so much for offering such a quality product. I have been attempting to use the crock in my home decor for years and have struggled to find the right arrangement.